Our fruits and vegetables are transported directly after harvesting, and then transferred according the respective requirements to the wet or vacuum cooling section by means of our innovative production technology and rapid handling systems. 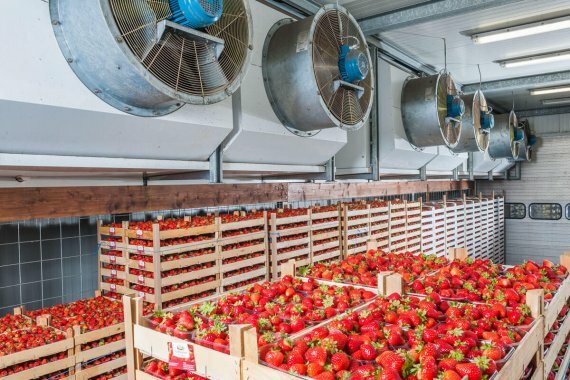 In the strawberry coolingare alone, we have over 250 pallet storage spaces available. With a cooling capacity of up to 10,000 pallets, not only do we always remain cool, but also our products remain cool too, and guarantee customers and consumers consistent, country-fresh quality. Here, where you can taste the quality. Production is conducted consistent with the strict Global GAP Regulations, and these standards are continued through an intensive Quality Management System (QS, IFS, HACCP). Regular checks made by the Chamber of Agriculture (Horticulture) confirm the excellent quality of our products.